With Vermont’s large variety of lakes, rivers, and streams means there is plenty of room to find a spot of your own. Whether you’re a seasoned angler or you’re just getting started, here are the six best fly fishing spots in Vermont. If you are going to find your own honey hole in Southern Vermont, Bob Young will probably be the one to introduce you to it. Having cut his chops on the mighty Batten Kill River, Bob now offers fishing tours in the Manchester and Bennington areas and everywhere in between. Get lessons on wading or casting from the drift boat for beginners well-seasoned anglers alike. Nobody knows the waterways between Waterbury and Winooski like Willy Dietrich, certified fly-casting instructor by the Federation of Fly Fishers. In July, when trout season is winding down, it is small mouth bass time, and Willy can show you just how to angle them. It all about the warm temperatures and good top water action. When you are on the Lamoille and Winooski Rivers, Otter Creek, or Mettawee River, there is one name to know. Ed Schirmer is a guide, instructor, an outfitter, and a tier. While his specialty is trout, he will also go for pike and bass as well. Since 1975, Ed has also been selling gear and clothing to outfit all of your angling adventures. 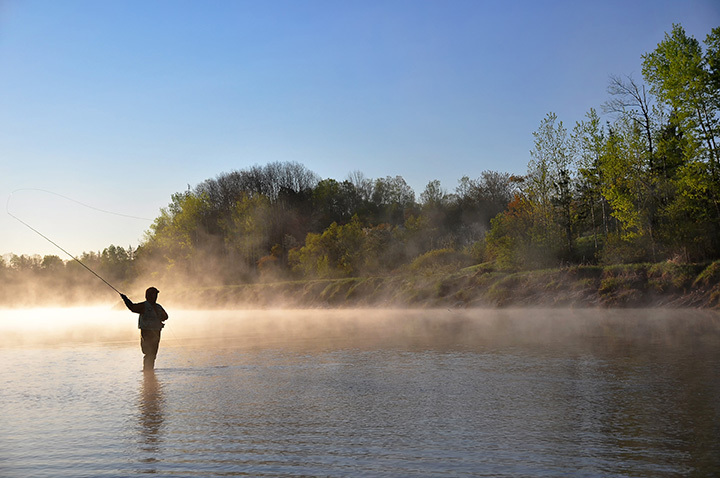 A 60-mile river and tributary of the Connecticut River, the White River is stocked with trout and salmon by Vermont Fish and Game. It is often overlooked in favor of the Lake Champlain tributaries, but fishing the White is almost always yields a catch due to its well-known rapids and relatively low fishing popularity. A tributary of Lake Memphremagog, the Clyde River is a beautiful trout stream with several sections of slow water are supplemented by short sections of rapids, where landlocked salmon come to spawn. Fly fishing the Clyde River requires many different strategies, as it is a very diverse river. Water types vary as the river is influenced by ponds and lakes as well as tributary streams. View more Vermont Fishing Holes.